Pigeon Bridge Campground in the Pigeon River Country State Forest is frequented by hikers as it serves as the trailhead for the Shingle Mill Pathway, a system of five loops that passes through some of the most scenic portions of the Pigeon River Country. Even better, the longest loops (10 and 11 miles) can be covered in 6 to 7 hours by most hikers, making them ideal for an overnight trek. The hike described here is the 10-Mile Loop, the most scenic portion of the Shingle Mill Pathway, which allows you to spend a night at the dispersed campsites on the north and south shore of Green Lake. 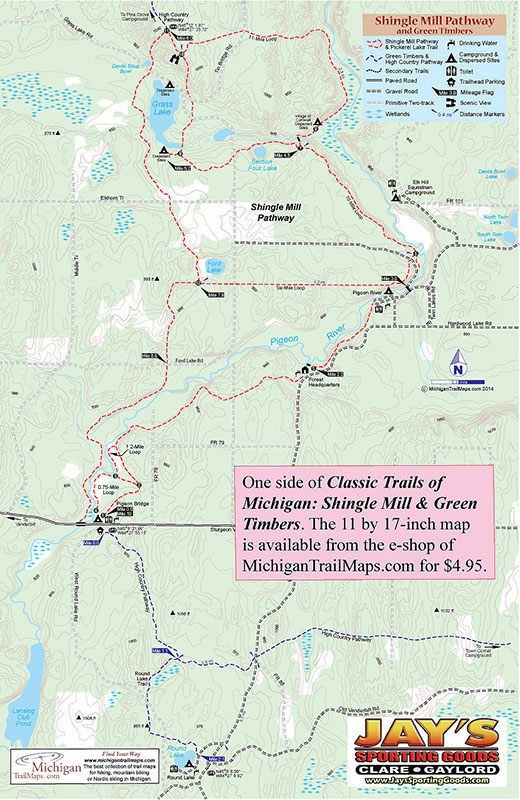 Click Here to order a detailed map to the Shingle Mill Pathway. 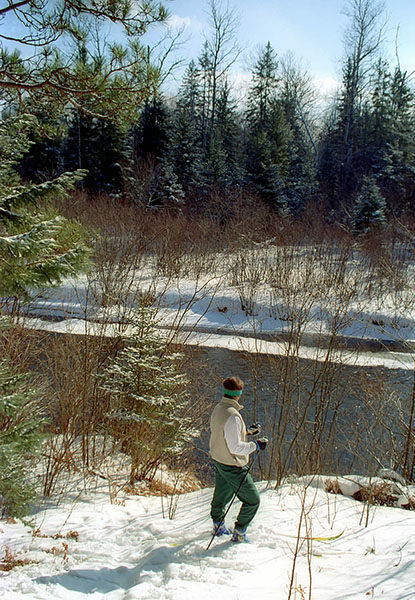 One of the most popular campgrounds in Pigeon River Country State Forest is Pigeon Bridge. Located in the heart of this 105,049-acre tract, the campground has 10 rustic sites overlooking the Pigeon River, making it a favorite with trout fishers, who toss flies, spinners, and worms in an effort to entice brookies and browns. But the campground is also frequented by hikers as it serves as the trailhead for the Shingle Mill Pathway, a system of five loops that passes through some of the most scenic portions of the Pigeon River Country. Even better, the longest loops (10 and 11 miles) can be covered in 6 to 7 hours by most hikers, making them ideal for an overnight trek. The hike described here is the 10-Mile Loop, the most scenic portion of the Shingle Mill Pathway, in my opinion, which allows you to spend a night at the dispersed campsites on the north and south shore of Green Lake. The lengths of the first three loops—.75, 1.25, and 6 miles—make them better suited as day-hikes while the second backcountry campsite is along the 11-Mile Loop. You can also pick up the trail at several other places in the state forest, including the Pigeon River Campground, which would turn the northern half of the pathway into 6-mile day-hikes. 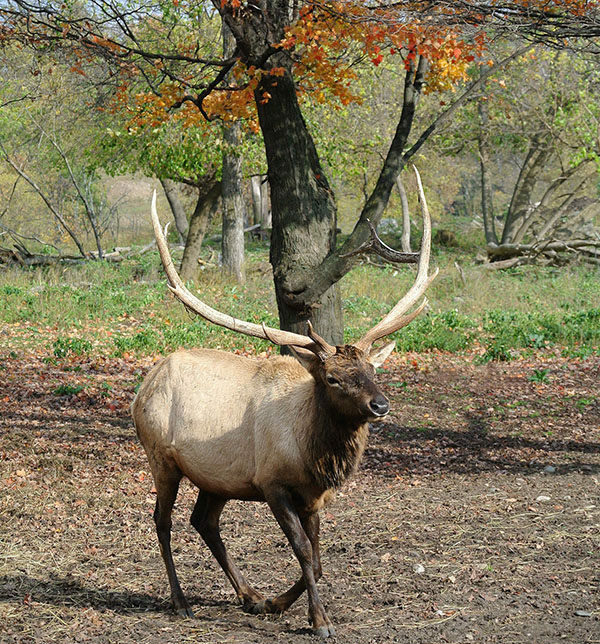 From spring through fall hikers share the pathway with mountain bikers. 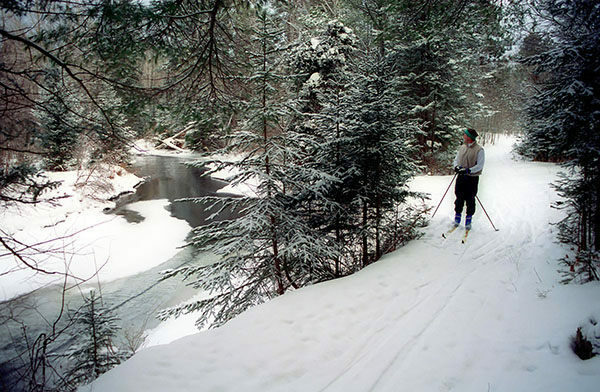 On November 15 deer hunters arrive for the 2-week firearm season, and in the winter Shingle Mill Pathway is a popular destination for cross-country skiers looking for a wilderness-like adventure. 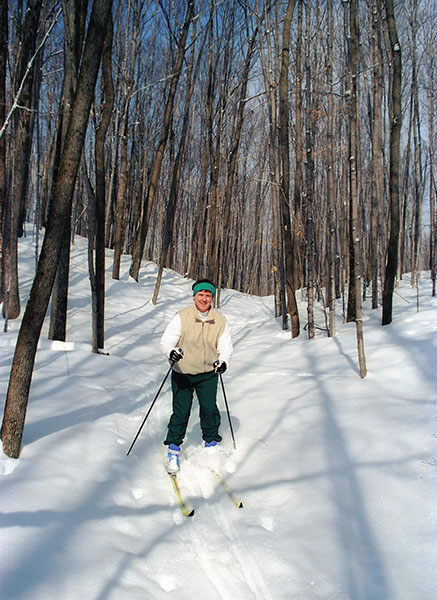 The trails are not groomed or tracked but experience enough use that skier-set tracks are usually visible. From the back of the campground is a trail sign and display map for the Shingle Mill Pathway. The trail departs north and quickly reaches post No. 2, the junction for the 0.75-Mile Loop, and in a half mile reaches post No. 3, where the 1.25-Mile Loop heads back for the campground. For the next half mile, the pathway skirts the Pigeon River and then leaves the scenic trout stream to climb a wooded ridge. It’s an uphill climb of almost 50 feet, but once on top you follow the edge of the ridge for more than a half mile, a scenic stretch of hiking in the fall, before descending to the Pigeon River Country State Forest headquarters, reached at Mile 2.2. 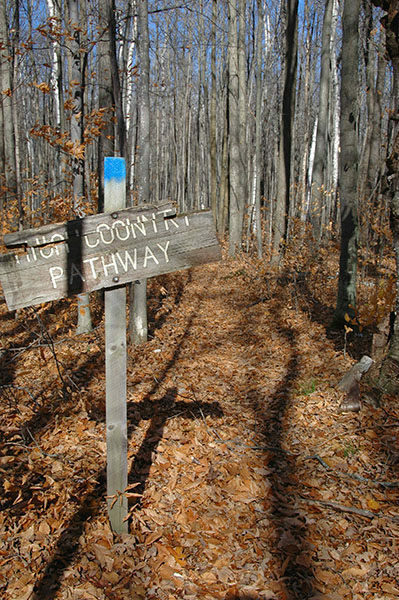 From the headquarters, the pathway climbs in and out of the river valley before finally descending to Pigeon River State Forest Campground at Mile 3. Pigeon Bridge Road crosses the river near the campground and Shingle Mill Pathway also uses that bridge and then hugs the west bank to quickly reach post No. 6. At this junction the 6-Mile Loop heads southwest (left) to quickly cross Pigeon Bridge Road. You head northwest (right) as the 10-Mile Loop immediately climbs a ridge bordering the west bank of the Pigeon River and then follows the crest of it for more than a half mile. Eventually you descend into a stand of red pine and reach post No. 7 at Mile 4.3. This junction marks the split between the pathway's 10-Mile Loop (west to the left) and 11-Mile Loop (due north to the right). Head left for the 10-Mile Loop and in less than a quarter mile the trail passes beautiful Section Four Lake. The pathway continues west and crosses Ford Lake Road at Mile 4.7. 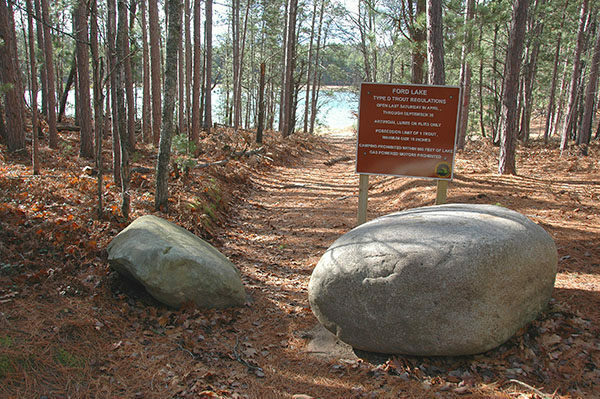 On the other side of the sandy road is a blue-tipped post where the trail reenters the forest of hardwoods and pines, and in a half mile, or Mile 5.2, it reaches one of the backcountry campsites on Green Lake. From the backcountry campsite the pathway swings north, skirts the south end of the lake, and crosses Ford Lake Road and then Grass Lake Road. On the other side of the roads the trail cuts through a logged area and then climbs through a hardwood forest to post No. 10, reached at Mile 5.8. The post marks where the pathway’s 11-Mile Loop merges back with the 10-Mile Loop. Also located here is a short spur to an overlook where you can gaze down on Pigeon River Valley or look southwest and see more than 20 miles of rolling northern forest. At post No. 10 you head left and in less than a quarter mile come to post No. 11, marking the junction where the High Country Pathway continues north (right). Head south (left) to stay on the Shingle Mill Pathway. The trail descends sharply and then breaks out of the woods to skirt Devil’s Soup Bowl, another sinkhole lake, just before Grass Lake Road is crossed again at Mile 6.3. Within half a mile the pathway crosses a footbridge as it passes within sight of Grass Lake and at Mile 7.8 comes into view of scenic little Ford Lake. From Ford Lake, you climb to post No. 12, marking where the pathway merges with the 6-Mile Loop. Head right to hike through some old clear-cuts, and at Mile 9 you will cross Ford Lake Road for the third time. In the final mile of the trek, you climb a ridge along the river, top off at 960 feet, and then descend into a wetland area. After crossing the small marsh, you’re a quarter mile from Sturgeon Valley Road. 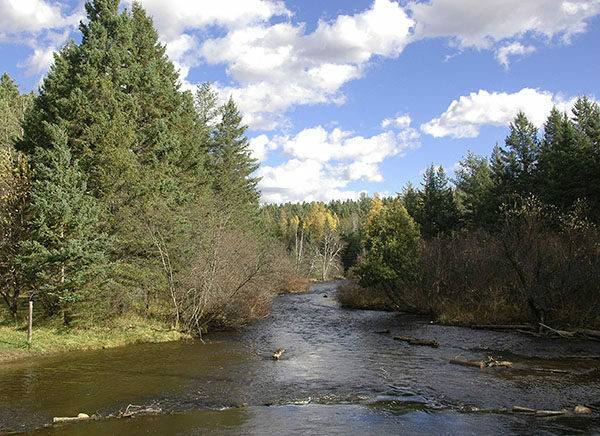 There are eight rustic campgrounds in the Pigeon River Country State Forest with the Shingle Mill Pathway beginning at Pigeon Bridge (10 sites) on Sturgeon Valley Road and passing through Pigeon River State forest Campground (19 sites). Dispersed camping is allowed along the Shingle Mill Pathway but a free Camp Registration Card is required. You can download one from the Michigan DNR web site by typing “Dispersed” in the search bar. From I-75 depart at exit 290 and head south for Vanderbilt. In town turn east (left) on Sturgeon Valley Road and follow it for 11 miles. The Pigeon Bridge State Forest Campground is reached just after crossing the Pigeon River. 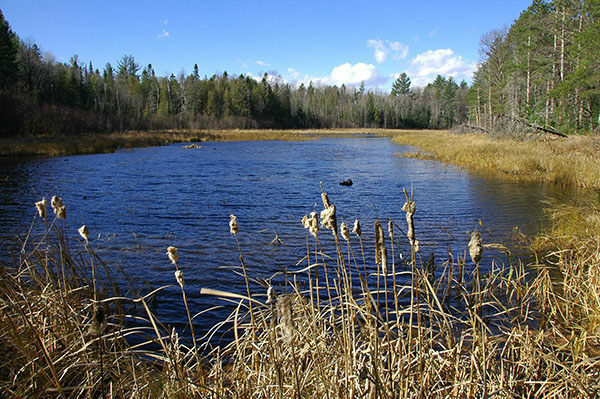 To reach the state forest headquarters continue east on Sturgeon Valley Road another 3 miles and then turn north (left) on Twin Lakes Road. The headquarters is passed in a mile.